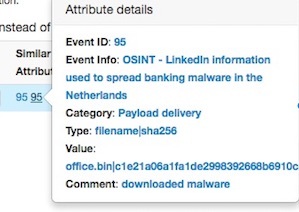 Quick Start · User guide of MISP Malware Information Sharing Platform, a Threat Sharing Platform. 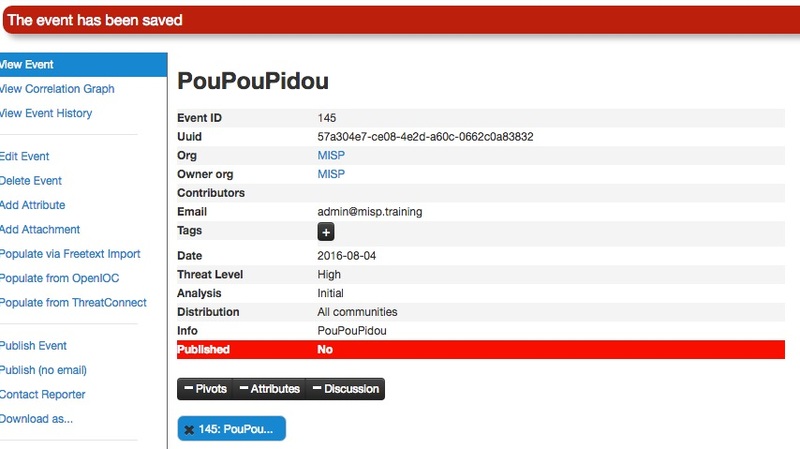 MISP (Open Source Threat Intelligence and Sharing Platform) software facilitates the exchange and sharing of threat intelligence, Indicators of Compromise (IOCs) about targeted malware and attacks, financial fraud or any intelligence within your community of trusted members. MISP sharing is a distributed model containing technical and non-technical information which can be shared within closed, semi-private or open communities. Exchanging such information should result in faster detection of targeted attacks and improve the detection ratio, whilst also reducing the number of false positives. With the focus on automation and standards, MISP provides you with a powerful ReST API, extensibility (via misp-modules) or additional libraries such as PyMISP, jump ahead to these chapters to get started. [a-z]: at least one lower-case character. All Generator tools are only possibilities without any guarantee! 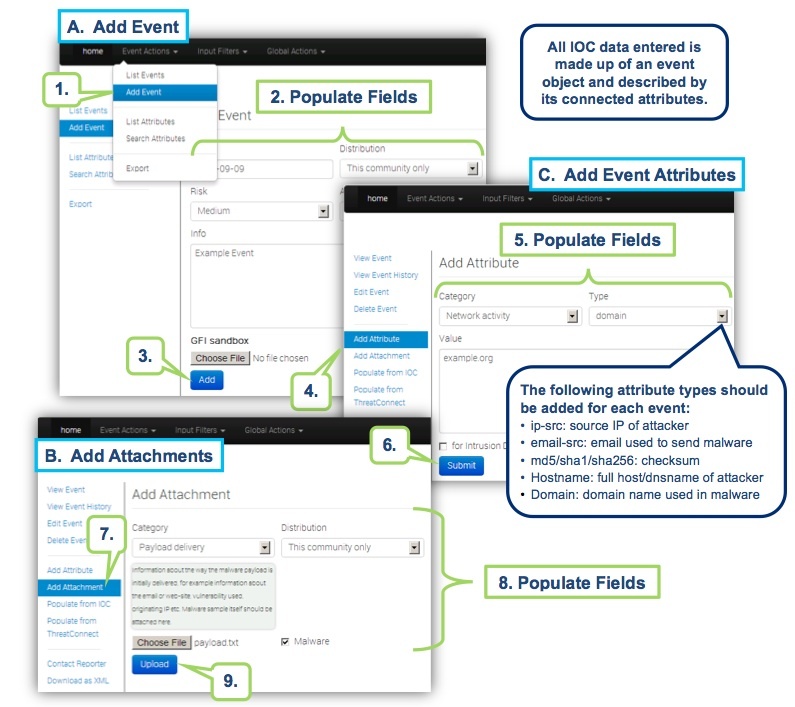 You only have to add a few pieces of information to register your Event. Further details will be specified after the Event has been added. 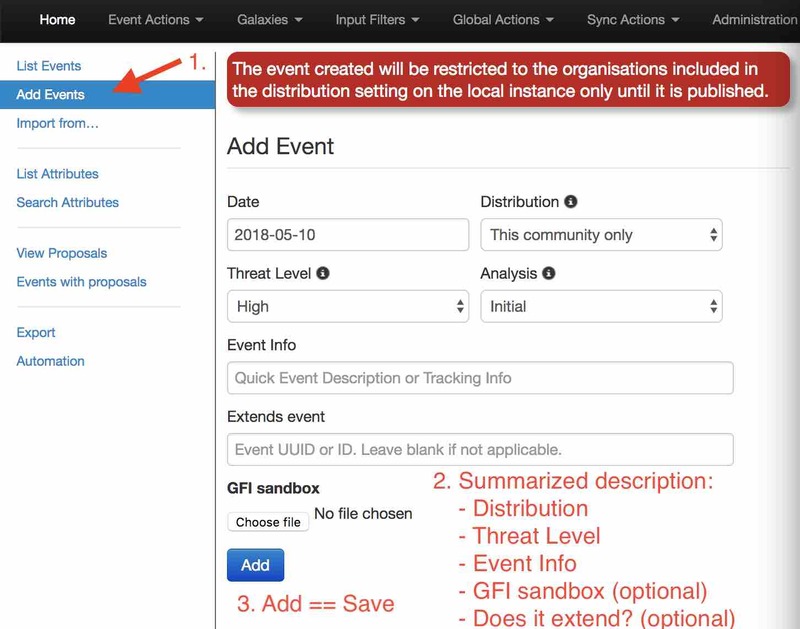 Now you can specify the information for your Event (you will need to scroll the window). If you have a list of indicators from which you would like to quickly generate attributes then the Free-text import tool is just what you need. Simply paste your list of indicators (separated by line-breaks) into this tool. 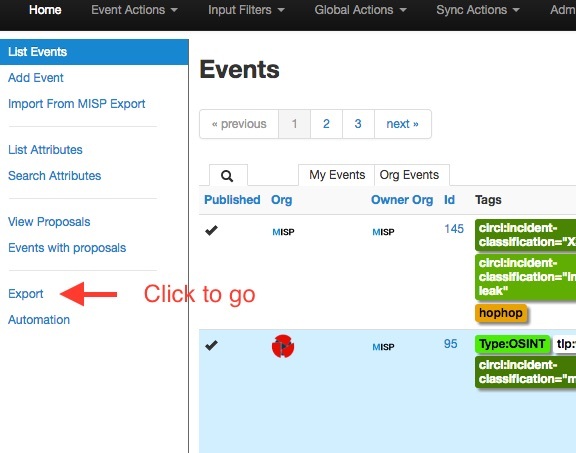 The tool will help you to find similarities between your import and other issues already registered in MISP. 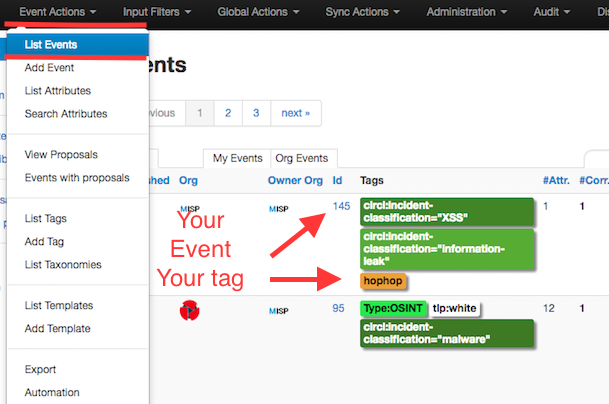 For example, you can see the ID of all related Events and view their information. 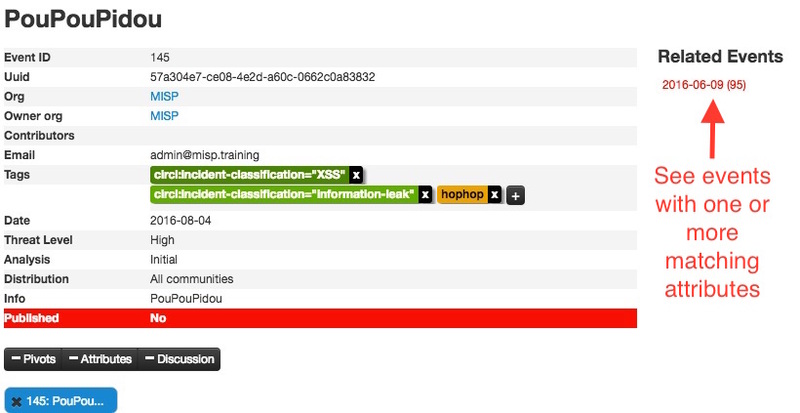 Another easy way to add information is to use Tags. 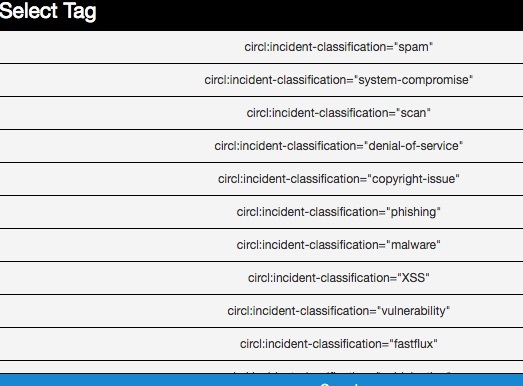 You can see the result of adding existing Tags (circl:incident-classification=XSS ans circl:incident-classification="information-leak). By clicking the button, you can add more tags from an existing Taglist. If you want make your own Taglist, select Add Tag. Then, when you add the new tag it will appear in the Custom Taglist. 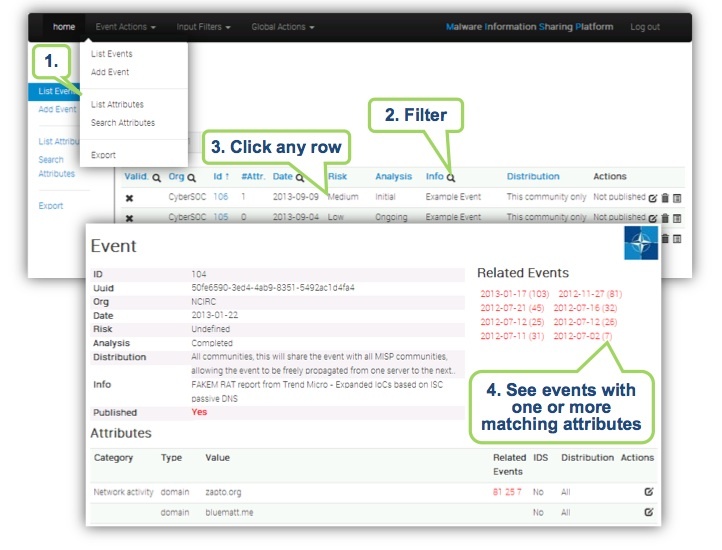 To see your Event, select List Events from the menu Events Action. You can click any row and select a filter. 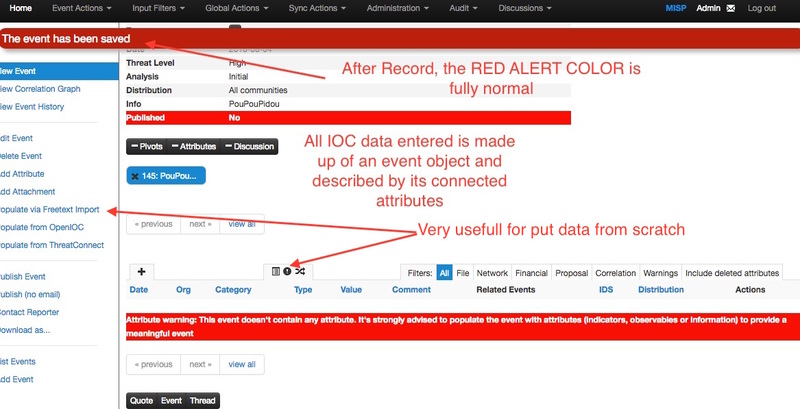 If you click on your Event&apos;s number, you can see all the information related to your Event. Export functionality is designed to automatically generate signatures for intrusion detection systems. To enable signature generation for a given attribute, the Signature field of this attribute must be set to Yes. Note that not all attribute types are applicable for signature generation, currently we only support NIDS signature generation for IP, domains, host names, user agents etc., and hash list generation for MD5/SHA1 values of file artifacts. Support for more attribute types is planned. 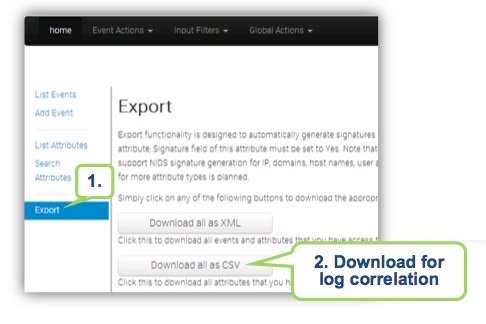 Simply click on any of the following buttons to download the appropriate data for log correlation.